This is one of our recent kitchen cabinet refacing projects in Wichita, Ks. 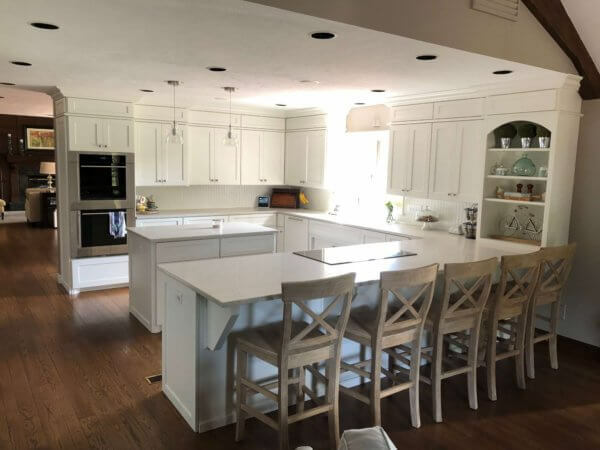 We refaced the kitchen cabinetry and island, added end panels on the cabinet ends, built up the existing cabinets to the ceiling and added panels, added a nice crown molding and another molding between the panels and the new cabinet doors. Next, we added a new dishwasher with a paneled front as well as updating the panels on the Sub Zero refrigerator and freezer. 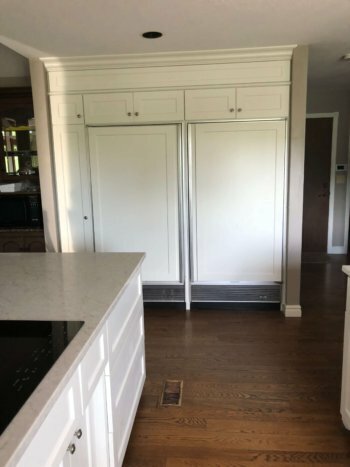 We also removed the existing double oven cabinetry and rebuilt it, making room for the larger Wolf 30″ double oven to match the Wolf induction cooktop. We also rebuilt the arched top cabinet on the counter, and added some large drawers for pots and pans. We extended the stiles on the island and the cabinet ends and added clean sweeps. We also skinned the existing bar back and the corbels supporting the Quartz countertops. Everything was finished in multiple coats of Sherwin Williams Alabaster White enamel for a silky, smooth finish. The result? A gorgeous chef’s kitchen for less than half the cost of all new cabinetry. “They just finished my kitchen and I am so thrilled with it. They refaced the cabinet boxes and made new cabinet doors. Everything looks wonderful. I knew what I wanted my kitchen to look like and Mark had some suggestions that really brought it to the next level. When getting bids, he was the only one that had some suggestions. I also chose him because he and his guys do all the work themselves. Other companies said they only make the cabinets and you needed to hire an installer to install the cabinet doors etc. and I wanted one person that would do it all, start to finish. Mark is a true professional who shows up everyday on time. He also cleans up every single day when he’s finished for the day. They would even sweep up the sawdust in the driveway! I’m so excited I now have my dream kitchen.” –Molly C. of Wichita, Ks.